One of the first steps to analyzing a deed is to identify the relationship, kinship, and even community role of every person named in a deed. Why? Because your ancestor did not live in a vacuum! So many people (neighbors, doctors, elected officials, and other family members) add to your ancestor’s story. The details of a deed may lead researchers to their ancestor’s home place or final resting place. Persons named in documents may introduce new family members, in-laws, female maiden names, neighbors or even enemies. Often legal land descriptions are provided in deeds, they may name neighboring lands, schools or even cemetery boundaries. This information is not limited to land deeds. They are provided in Sherriff deeds, law suits, probates, etc. Why is this important? A recent deed mentioned a bordering cemetery of the late 1800’s. Older plat maps also showed the cemetery to be exactly where it was described with all the neighbors surrounding. But the original records were ensconced in a local University Special Collections. 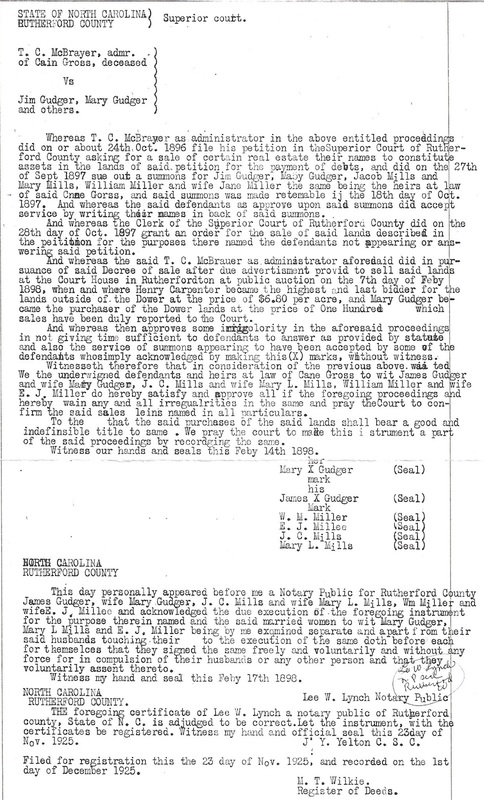 Without the name of the cemetery, I would not have located papers on the family that gave detailed information to include veteran troop information. Sure, the plat map (sometimes you have to plat the land) helped this search, but it was the original deed that made this research project a success. Another arduous brickwall wall research was solved by tracing land deeds that led us to locating Cherokee Freedmen and the unscrupulous practices of an ancestor. Seems, our ancestor used his negotiating skills to acquire land from the less fortunate by loaning money with impossible payback schedule. Yes, he was a true user of usury! However, he quickly acquired a lot of land in Nowata (OK). A recent deed provided three great finds. 1) The migration of the family, 2) the daughters surnames, 3) and spouses names. With names like Jane and Ella Gross, the likelihood of finding these girls was nil. 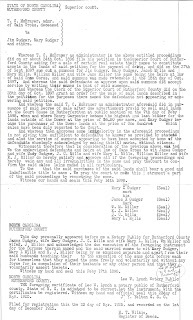 But a North Carolina deed submitted to the court almost 29 years after the death of their father, not only gave the legal land description but the residence of Mary and Ella and their respective husband’s names. It is not uncommon to find a deed to be submitted to the court years later than expected, so be sure to span your time frame when researching these documents. “Property’ does not always translate to land. Slaves, for one, were also property. Following an inheritance deed, I was able to follow not only the slave, but the slave master who migrated from Virginia to Charleston, S.C. Elaborate details of the migration and terms of the slave’s purchase agreement were outlined. Other property may include the inheritance of a horse, a printing press, or barrels of wine. These are just some property deeds that have lead us to finding families and kinfolks migrating from the south and moving west. I am amazed to learn how much can be found through deeds. Let me ask a beginner's question: Are many deeds online, or is a trip to local archives (courthouses?) necessary for the most part? Posts like this one have spurred me to nominate your blog for a Blog of the Year 2012 award. For details, just go to my January 10th blog post if you want to accept the nomination! Mariann, Thanks for the nomination. I'm honored! Thanks so much for the award and for the blog writing encouragement! Kathleen, thank you so much for this excellent information about deeds and what to look for when we analyze them. I recently received some old 1889 Colorado County, Texas deeds just before Christmas. They are so important to my research, but I am sad to say I cannot read a word of them -- ARGH! I am beyond frustrated with both of these copies!!! The writing is so small that even when I use a magnifying glass, I still cannot make out all the details of the text. Thankfully the example deed that you use here is in typed text. Both of my deeds were handwritten in some of the tiniest writing I have every seen with deeds. So do you have any suggestions or recommendations that would help me to decipher what they say? And while I'm here, I want to CONGRATULATIONS on the blog awards that Mariann & Mary Ellen have bestowed upon you. Trust me you deserve them and much more!